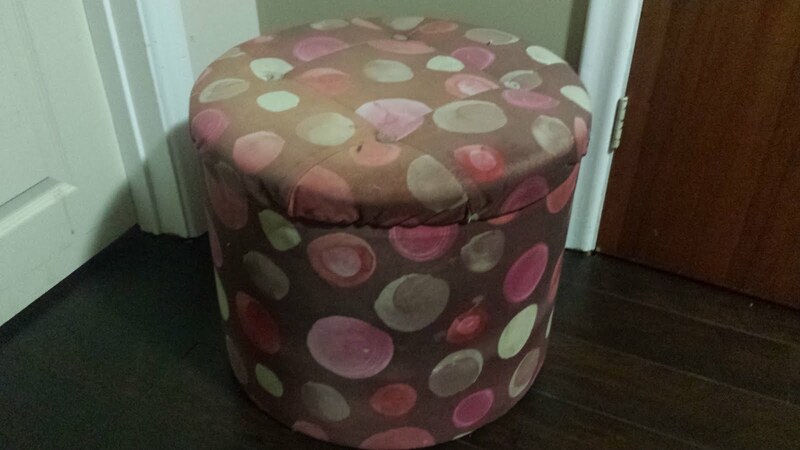 My new stool is beautiful. Can you believe I used a throw to cover it? Here's how I got it done. Fabric with some give, some stretch. I used one side of a throw. I measured the height of the stool, adding 4 inches that would make up the seam. I measured the exterior circumference of the stool adding 4 inches, again for the seam. This will give you the dimensions (e.g. 18"x 80") for the rectangle shaped fabric that will cover the bottom part of the stool. Making sure all the lines of the rectangle were straight, I chalked out the rectangle on my fabric. I turned the stool upside down and traced the top of the stool, using chalk. Again, I added about 4 inches all the way around, 2 inches to cover the sides of the top and 2 inches for the seam. Then I carefully cut out the circle. I sewed the ends of the rectangle together with a 2 inch seam with the wrong side (not the pretty side) facing in outwards. Using a needle and thread, I basted the wrong side of the circle to the wrong side of tube (made of the rectangle) with a 2 inch seam. I gently gathering the edges of the circle to fit in to tehe tube smoothly. Each gather was about 1 - 1 1/2 inches apart. Just a tip, basting your pieces together keeps them steady when your trying to sew straight lines using your sewing machine. I carefully went over the basting with my sewing machine, making sure my seam was straight. 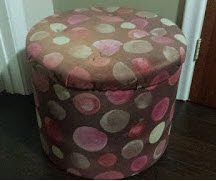 I then turned my new stool cover inside out and pulled it over the old fabric. I turned it upside down. 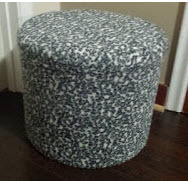 Using a staple gun, I secured the cover on the inside of the stool, gently pulling as I stapled. ...and voila! Another project for me to be proud of. Hope you love it too and feel inspired to renew something for the fun of it! Let me know what you think, I'd like to hear from you. Have any questions?